When I was an undergraduate at the University of Windsor, my wacky room mate had a friend who ate her pizza with peanut butter where the tomato sauce should have been. She swore it tasted great (I declined to sample a slice). During my childhood in Montreal, my friend Gemini II used to eat liver sandwiches with cream cheese (again, I believe I passed on that one). The well-known duo of french fries and mayo always struck me as odd until I was served sweet potato fries with mayo at one of my favorite vegan restaurants (which, of course, prompted me to head straight home and prepare spicy sweet potato fries with avocado mayonnaise, and now I’m hooked). I’m sure you’ve got your own personal favorite fixings that, any disparaging comments aside, you adore nonetheless (and please feel free to ‘fess up in the comments section!). Well, as some of you may recall, the HH and I have just a smidge of surplus mint around here this summer. Yes, indeed, I’d venture to say that my garden is in mint condition! I’ve been concocting as many beverages, appetizers, dips, entrées or desserts containing the stuff as my little hands can muster, and even thought I was doing pretty well until the other day when I stepped round the corner of our house and saw that those darned wanton herbs had been propagating over night–it appeared as if I’d used nary a leaf! And so, by dint of mint, I was forced to come up with yet another recipe showcasing the stuff. Which actually worked out perfectly, since Holler and Lisa’s No Croutons Required event this month requests a salad focusing on a favorite herb. Well, if by “favorite,” they meant “so much that I could rip bagfuls from the yard and still have enough left to freshen the breath of the entire town of Gilroy, CA on July 25, 26 & 27th in the month of July”; or “so much that I will have to start using it as packing filler when I mail trunks of fine china or glassware across the Atlantic” or “so much that even the thought of mint makes me feel a bit queasy, which, as it turns out, is actually okay, since mint helps to aid in proper digestion” or “so much that I will have to cook at least one dish with mint in it every single day for the forthcoming 11 months, until it sprouts up again next summer, just to use it up”–well, if that’s what they meant by “favorite herb,” then yes, mint is indeed my favorite, and definitely deserves to be featured in my submission to the event. I do enjoy a good fresh peach, but when I saw three of the fuzzy spheres nestled in our organic produce box a couple of weeks ago, I almost despaired. A properly ripened peach is a wonderful thing, but there seems to be a terribly small window of maturity wherein peaches are at their apex of flavor and texture–firm, juicy and sweet-tart–before they quickly decline into dry, powdery mush. If not eaten precisely on the right day (sometimes the right hour), the peach becomes unappetizing at best, perhaps suitable for a sauce or baked good; at worst, it’s both tasteless and unpleasant, and destined for the compost bin. Given the capricious nature of the downy stone fruits, I decided a salad would be the perfect context in which to combine it with other ingredients that could overshadow their potentially less-than-stellar consistency. Mint was a given, of course, and for some reason, I felt that cucumbers would also suit the flavor palette. The final addition was sweet corn kernels–partly because they just called, “pick me!” and partly because I thought the color would work well with all the other summer hues, which always elicit a desire in me for fresh fruits and veggies. In the end, we both adored this random combination of ingredients and have now consumed it four times in the last 2 weeks. The peaches are tart and luscious (and even the sub-par slices soak up the dressing and seem more juicy); the cucumber is cold, watery and mild; the corn is crisp and sweet; and the mint is pungent and peppery, all culminating in a perfect pastiche of color, flavor and texture. It’s true, peaches, corn and mint may not have been born for each other; but their arranged marriage in this dish makes for one very harmonious union. This salad comes together quickly, resulting in a fresh, crisp, juicy, altogether irresistible side dish for almost any warm weather meal. It’s best eaten right away, but will keep for a day in the refrigerator. This is a great idea 🙂 I love adding mint to salads. And Vietnamese food uses mint in interesting ways too. Thanks for the recipe! I loooove peaches (or nectarines) in salad – and sometimes in summer throw them in a salad to make sure they get used. I particularly like them in a salad with tomato and capsicum but now am quite keen to try this corn and cucumber combination – roll on summer! Glad the mint is still there – it will go when you need it most – that is way of herbs in the garden in my experience. Have you tried tabouli with mint in it? Just a thought as we had some lovely tabouli tonight with dinner. C. Did I mention that I love peaches? I love peaches and mint, but it never occurred to me to combine them–what a great idea! It sounds delicious with the lime and the agave…mmmmm. Now I need to find some “perfect” peaches to use, because I agree–if not eaten at the right moment, they are just not the same! 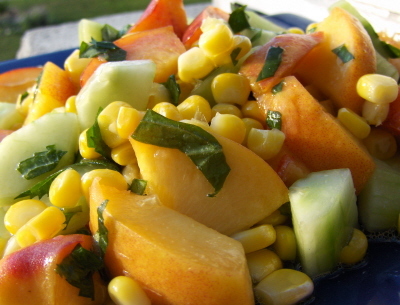 You have such a knack for these dazzling taste/texture combos- corn, mint & peaches…sounds like true inspiration to me! That salad sounds so refreshing and delicious! I love mint with both sweet and savory applications, and your idea sounds like the perfect combination of both. P.S. My strangest food combination I can think of was taught to me by my friend and former roommate, Ann — top waffles or pancakes with peanut butter AND maple syrup! YUM. Sticky-sweet, ever so slightly salty, and delicious! Would I ever thought of this “arranged marriage” – likely not. Does it look interesting – absolutely. Would I try it? – maybe by tomorrow. What I really want to know is what the dogs had to say about it. Well it is a combination I would never have though of. But as I read your descriptions of the flavours, I thought, yeah this would actually be really good. And it is such a pretty salad! Thank you for entering it into No Croutons Required. Mint and peach indeed sounds yum! I love your colourful salad creation. And I hear you on “mint is taking over my garden”. My parents have the same problem with water-mint. The tomato/pepper combo sounds great with peach, too (what colors!). And really, I don’t think there’s much chance the mint will go before we run out of ideas. Tabbouleh’s been on my list for a while–just haven’t gotten around to it yet! A peach-lover! I had no idea ;). Glad you like the salad! The beauty of the salad is that this actually renders some sub-par peaches a little juicier, since they soak up the dressing! I even liked this one the next day. Aw, thanks! It’s very fresh and summery if make it on a hot day. Thanks so much! It’s really a lovely combo–let me know how you like it if you do give it a try! Sorry to hear about your plant! My basil plant is also gone due to some blight, but I have no idea what to do to prevent it or fix it! No, you’re not offending me or the blog–DDD welcomes any and all friendly folks (well, maybe not Julia Roberts). My HH is a big meat eater and enjoys something similar to you–smoked salmon or sliced turkey on a “Muesli” bagel–that is, one with raisins and sunflower seeds–looks yucky to me, but he just loves it. The cheese and beet combo sounds intriguing to me! And PB and nutella? Heaven!! When I was in college (the first time around) I used to eat baked sweet potatoes with peanut butter… All of my apartment-mates thought it was bizarre, but I thought it was a perfectly scrumptious way to add a bit of protein to my sweet potato lunch! Thanks for this entry Ricki. A very refreshing salad for this crazy heat we are suffering through in Ontario. This is such a beautiful salad! I adore peaches and I also have a ton of lovely chocolate mint growing in my yard. Now I know what to do with some of it anyway! What a fun, inventive combination! I feel sad for those people who don’t experiment with new food combinations, they are certainly missing out! You really are the master of odd-but-intriguing ingredient combinations! Sounds great.